This traditional dish has been made in Korea for hundreds of years and is an amazing way to make vegetables go further. With this simplified recipe you can try it in your own home. 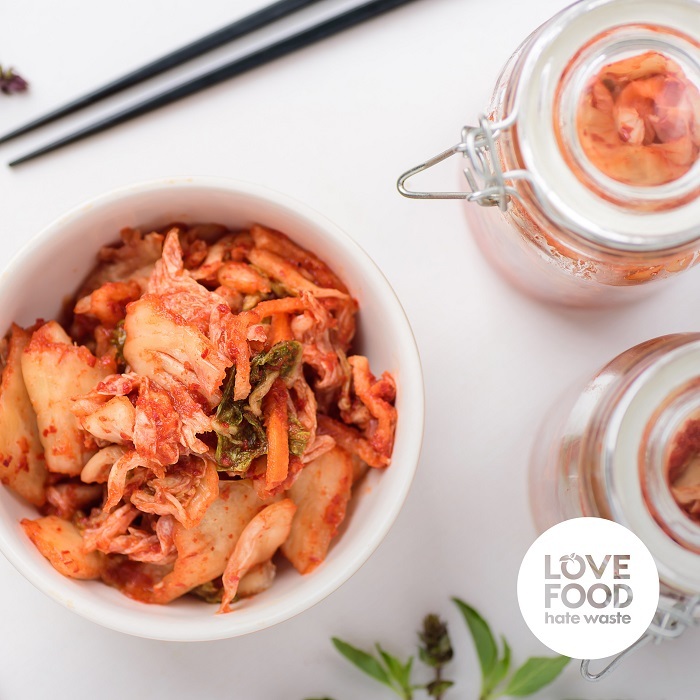 Mix together your kimchi paste by blending together the fish sauce, ginger, garlic and chilli sauce or flakes and then blend to a smooth paste. If you can't find traditional Korean chilli flakes then other hot sauces such as sriracha will work too. You can make it as spicy as you like. Put the cabbage, carrots, radishes and onions into the bowl and mix together with the pasta. Kimchi would traditionally have carrots and radishes in but why not experiment with what you have in your fridge that needs using up? Once everything is thoroughly mixed together pack the mixture into a sterilised jar so that it is tightly compacted. Leave about two centimetres from the top of the and push down on the mixture until some of the juices cover it. Your mixture should always be covered by liquid. Leave your jar at room temperature for about 5 days, checking on it each day by opening the lid. Once it has properly fermented keep in the fridge and enjoy with rice, noodles or even in pancakes. The flavours will get stronger over time. This dish is ideal for weekday suppers as it only takes ten minutes to prepare and uses just one dish for cooking. Use your favourite variety of sausages and swap parsnips for potatoes for an equally tasty result. This is a really quick and tasty Boxing Day treat which uses up leftover turkey, and can be served with any leftover green veg. Make sure you have some crusty bread for dipping in the sauce too! We partnered with innovative packaging and hygiene solutions maker Sealed Air to inspire employees to food saving heroes.